Tuesday afternoon, Freddy Galvis, 29, signed a one-year contract to play baseball for the Toronto Blue Jays. The deal guarantees Galvis $5 million next year and either $1 or $5.5 million in 2020, depending on whether or not the Blue Jays exercise their team option on the contract. Even though contract expectations for Galvis were maybe a little bit higher than that coming into the offseason (you guessed he’d get two years and about $15 million), the deal he ended up accepting still seems like a pretty good get for a guy who posted a .294 wOBA last year and hasn’t ever posted a wRC+ above 85 (last year’s mark). In Toronto, Galvis will join, at least to begin with, 25-year-old Lourdes Gurriel Jr. as a candidate for the Blue Jays’ starting shortstop job out of spring training, but he will likely thereafter end up spelling the younger man as a defensive replacement late in games and perhaps also against tough righties. Gurriel, the younger brother of Houston’s Yuli and son of Cuban baseball legend Lourdes Sr., had a reasonably strong debut season at the plate in 2018 (his .446 slugging percentage was particularly promising, paired as it was with a modest-for-today 22% strikeout rate) but injured his knee in August and his hamstring in September and worried observers with occasionally puzzling footwork at short. In Galvis, the Blue Jays have an insurance policy against a scenario in which the bottom falls out of Gurriel’s offense (because he doesn’t walk very much, almost all of his value at the plate comes from his power stroke) and his defensive lapses therefore become intolerable. Galvis isn’t better as a hitter — in 2018, in fact, he was about 20% worse, at least as measured by wRC+ — but he’s always had a solid defensive reputation and, as a seven-year veteran, his approach at the plate is enough of a known quantity that it is unlikely to fall entirely off a cliff. If Gurriel’s offensive performance ever gets to the point that it begins to look like Galvis’, the deciding factor will be the defense, and Galvis is likely to win that battle. It didn’t really work. 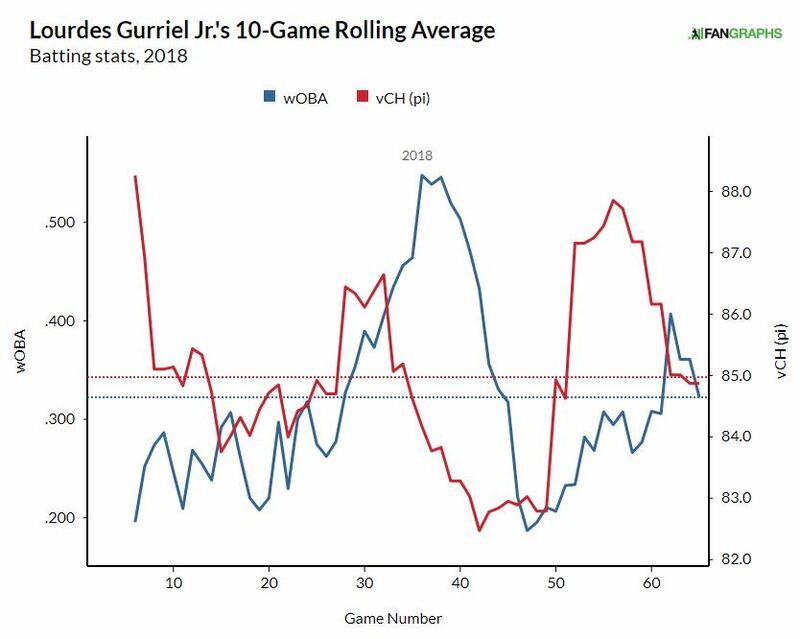 Gurriel ended up generating a positive run value on changeups (a full run overall on the season, and 0.98 runs per 100 pitches seen) — his only positive value for any off-speed or breaking pitch — and so by the end of the season he was seeing changeups only 5% of the time while getting curveballs and sliders 15% each. He still needs to figure out how to limit damage on those two pitches, so the journey isn’t over yet, but I find it highly encouraging that he was able to change the book about him so effectively in only his first full season. The question, then, will be the glove — which brings us back to Galvis. During his long tenure in Philadelphia, Galvis periodically had articles like this written about him (or this or this), all of which raved about his ability to effectively lead teammates in the clubhouse. If there was a shortstop on the market who could reasonably be expected to be a stabilizing veteran presence behind a young and talented newcomer, it was Galvis. Don’t get me wrong, he’s not a non-entity yet — Gurriel has yet to demonstrate he can start for a full season in the big leagues, and so it’s entirely possible Galvis will get 30-40 starts in the field before all is said and done — but the available evidence suggests Galvis will be suited for a mentorship role when the time comes. For the Blue Jays, then, it’s basically all upside. If Gurriel breaks out and shows he can handle the starting position full-time, great — the Jays either have a worthwhile backup or can exercise Galvis’s buy-out and explore other options in 2020. If Gurriel falters, or if Galvis changes offensively in a way that suggests he’s something other than what he has been for the last seven seasons, the Jays have a perfectly acceptable if unspectacular shortstop for 2020 at an affordable rate. Monday morning, the worst case scenario for the Blue Jays at shortstop was a black hole in Canadian turf. Now, it’s Freddy Galvis, and all they had to pay was money. That’s a definite step up. We hoped you liked reading Freddy Galvis Gives the Blue Jays Options by Rian Watt! With this context surrounding Galvis, I suppose this signing does make more sense than it originally did to me. At first, I was thinking about Aledmys Diaz and wondering why a team would effectively swap Diaz for Galvis — they are different players overall, for sure, and Trent Thornton (the player in the Diaz trade) isn’t nothing. But the mentorship role you mentioned and the fact that I wouldn’t want to bet my life on Diaz at SS, and it does make sense. You changed my mind from my original thought. Cool!